N97266: The Details and Therapy – EHFC Members Talking! As all of us know, we at East Hill have suffered through four months without Skyhawk N97266 due to a pilot-induced incident in May. This article is a review of that incident, what we learned, and contains our recommendations for improvements from which we can all benefit. This pilot was attempting a simulated “zero-zero IFR takeoff” (with the hood on from the start of the take0ff roll) on Runway 32 with a safety pilot. During the takeoff roll, this pilot noticed the airspeed was not working correctly and though he tried to “hold the airplane on the ground” with the yoke (rather than reducing throttle) the aircraft became airborne. The pilot then panicked and “chopped” the power at approximately 50 feet in the air and dropping hard onto the runway and as was discovered later, bent the firewall dramatically. As they taxied off the runway, the tower inquired twice if “everything is OK?” having witnessed the severity of the “landing.” Both pilots admitted it was an amazing crunch. Back to the ramp, these pilots checked the airplane over carefully, but didn’t see anything externally amiss. They then proceeded to disassemble the pitot tube (! ), removed some bugs and fired up to go flying again (!) performing three instrument approaches at three different airports. Our Policies and Procedures (Flight Rules) clearly prohibit pilots from re-dispatching a flight after an emergency or precautionary landing until a maintenance inspection is performed and the aircraft is released for further flight. Pilots are prohibited from doing any maintenance (we have a strict “no tools!” policy). 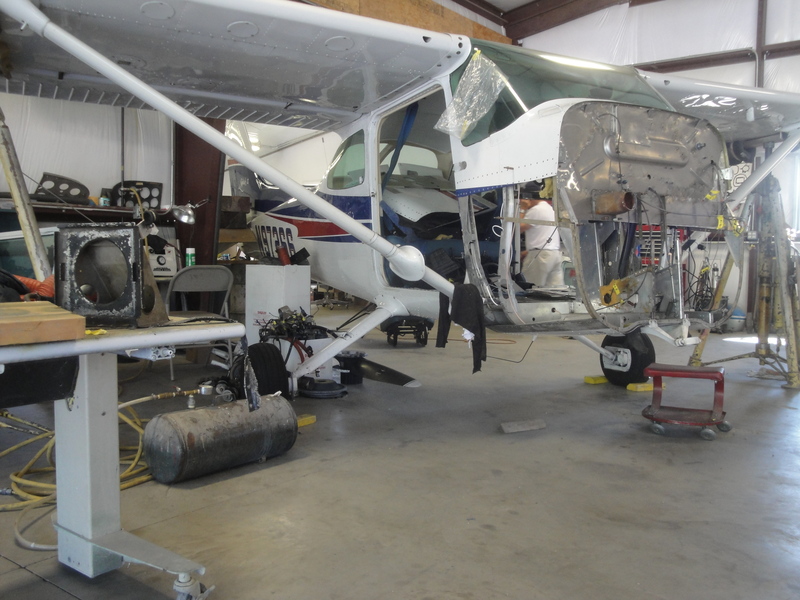 We employ a mechanic on staff and at the very least a CFI should be consulted to make sure safety is not compromised. In this situation, the pilots didn’t follow our procedures or common sense and instead fell into the “mission mentality” and forged on despite obvious difficulties. Flying this damaged aircraft for another 1.6 hours was certainly a bad choice. As it turns out there was also no clear report of the extent of this incident either. Reporting it as a “hard landing” later (which they did) with no details really did not clearly convey the “gravity” of the incident. They certainly should have used the safety reporting system for a detailed description. N97266 is now back with a repaired firewall and a new Penn Yan engine. It was an expensive exercise, time-consuming and frustrating during a great flying summer. This aircraft will still be limited to high-power cross country flights for another 20 hours to break in the engine properly. The primary pilot has received extensive retraining and is now more comfortable with surprises and less dependent upon a functioning airspeed if this should occur again. Unfortunately, we cannot cover every possible surprise situation in training but we can train pilots to be ready and vigilant. All pilots must be ready to “fly the airplane” if they encounter an abnormality. We should all be aware that complacency , which develops with more hours, is especially prevalent during the take-off phase and can leave us unprepared to cope with a surprise! This particular pilot’s pre-takeoff briefing was “chop power and land if anything happens” Please examine your own pre-takeoff briefing and think carefully about what specific actions you would execute in the case of various emergencies. This briefing should also be contextual, taking wind and changing conditions into account. Briefing a turn back on a day with a 20 knot head wind would be inappropriate and unsafe. What would require a power chop in the air? Probably not an indicator failure. The historic presolo requirement for a “simulated power failure on initial takeoff” was removed from 61.87 several years ago and this pilot had unfortunately never been shown or tried this maneuver. 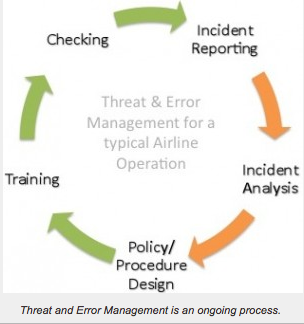 As I was writing this article, Larry Baum e-mailed a very good blog post on “threat and error management.” This is a common procedure in more regulated flying environments like the airlines and charter operations (and their superior safety records are partly a result of this kind of discipline) Threats and errors must be identified or “called out” and specifically identified so others can become aware and avoid them. Training and flight procedures are then modified to eliminate or mitigate the risk. This is an ongoing improvement process. Increased safety reporting at our club is another way we want to benefit from this incident; share your experiences, learn from the mistakes of others and move forward. We have now modified our flight training procedures to include more emergencies, we want pilots to be more ready for surprises (and eliminate complacency on take-off ). Please read through this article on threats and errors and use our safety reporting system for any perceived threat or abnormality. This is a perfect tool to alert us all to situations and problems before they result in tragedy. Through shared knowledge we can improve our training, flight procedures and make us a safer club! To be successful, we need everyone involved at all levels. The puerile kindergarten view of “finking” or “tattling” on others turns out not to be a mature or helpful attitude with safety reporting. We all share these planes and the facilities and if someone is either creating an unsafe situation or looks shaky in their skills, we all benefit by knowing this! Friends don’t let friends fly unsafe. If you see some, damage overt or subtle, or some strange activity, we all need to know ASAP. Your ideas on this are very welcome; our strength is our members, we depend on each other to be safe! Why would a pilot, ever simulate a Manuver that they would never do in real life?? The no visibility is not legal for an airline pilot, so why would a PPL think that is something they would ever need or want in their toolbox? Hopefully this pilot was not intending on using this skill?! Ah the ability to think out the consequences of what are doing (and plane for what ifs), versus the value is a bit key. And this pilot absoultly showed why take-off in zero viz it is a bad idea, when the airspeed didn’t move (and he was under-hood) no wonder he paniced; is it a situational overload cause by the lack of our primary information source, vision, in a critical Phase of flight. I hope he ripped the hood of, before they chopped power. Good article! These kinds of incidents certainly punctuate how things can get out of control pretty easily. Thank you for recognizing my article on Threat and Error Management! Hope it adds some value. Best of luck!